Johnny Cueto is the closest thing the modern baseball world has to Luis Tiant (you know, this guy!). Cueto is just fun. He can go through an entire at-bat without repeating the same windup twice. He’ll corkscrew himself around and hesitate mid-windup, like he’s pausing to reconsider, then unleash a 96-mph fastball in on a hitter’s hands. On the next pitch, he’s apt to barely wind up at all, only to drop in a long, slow, looping breaking pitch that might remind a few of the eephus. All of this with dreadlocks flying around wildly, and hitters tying themselves in knots trying to figure out what’s coming next. I was ecstatic when the Giants signed Cueto to a six-year deal (with a player opt-out after two…more on that in a sec) this offseason. While I’m merely in like with the Jeff Samardzija signing, I’m flat out head-over-heels, ready to propose over this sign. Cueto is not only one of the most entertaining pitchers in the league, but he also has some of the filthiest stuff, and should be instantly popular with Giants loyalists. When he’s on his game, he’s a joy to witness, mixing five different pitches with just as many goofy-looking windups. Case in point: Watching him carve up the Astros in his ALDS Game Five start was a thing of beauty (unless you’re an Astros fan). He gave up a two-run homer in the second inning and then retired 20 straight; the hard-swinging Astros never got another runner on base against him after his second-inning blip. Cueto had them eating out of his hand. When he’s on, he combines dominance with showmanship and, hell, isn’t that why we watch sports? Since 2011, Cueto has been pretty much always been “on”. His ERA from 2011 to 2014 was 2.48, and he’s been one of the National League’s dominant pitchers for years now, though maybe his brilliance has flown a bit under the radar after pitching in Cincinnati. He won 19 games in 2012 and would have coasted to the Cy Young in 2014 in a world where Clayton Kershaw didn’t exist (Cueto’s numbers that year were ridiculous…2.25 ERA in 241 innings). He was his same old self in the first four months with the Reds last year, too. He’s an ace, worthy of being mentioned in the same sentence as the Kershaws and Greinkes and Prices of the world. However, enthusiasm over Cueto’s services this offseason was a bit dampened, at least more than you’d expect for a guy with his resume. There are 81 and 1/3 reasons for that. Cueto kind of sucked after being traded to Kansas City. In those 81 innings and change, Cueto’s ERA was 4.74 and he gave up ten home runs, which was disconcerting because he left a homer-friendly park for one that was not-so. He also got absolutely blasted by Toronto in his one ALCS start, so there’s certainly still a bit of a bad aftertaste for anyone who watched that debacle. If you perform an autopsy on his stint with the Royals, though, it’s clear that his crumminess was limited to four bad starts (which was four more than he’d had in the previous four months with the Reds, but oh well). Those ten home runs? Yeah, seven of those were hit by the Orioles, who teed off on him in two separate starts. The O’s were third in the league in home runs, so it’s more likely that Cueto just made a handful of bad pitches to a power-loaded offense than it is that he’s suddenly become homer-prone. Cueto’s last four regular season starts were excellent, and he was dominant in two of his four postseason starts. So while some wariness is expected, what are you going to hang your hat on: the 80 shaky innings in Kansas City, or the 800 Cy Young-caliber frames that preceded them? It’s not like he had some career-altering injury that led to the ineffectiveness, either. There was even some speculation that Cueto’s struggles were due to not being able to get in-sync with his catcher Salvador Perez at first. It might be a lazy, after-the-fact witch doctor explanation, but sometimes those small sample size anomalies really can be attributed to minute stuff like that. Quite frankly, I’m bullish on Cueto returning to ace form and I think Cueto is a prime candidate to turn into an immediate fan favorite by the Bay. Giants fans love their quirky players, especially when those players perform, and few pitchers combine quirkiness and quality quite like Cueto. Plus, there’s a decent chance the Giants come out like bandits in this deal with this opt-out built in after the second year. Opt-outs are a fairly recent phenomenon. They’re clauses that player agents love to insert into long-term deals to help their clients cash in for star performance mid-way through a contract. It’s beneficial to a player if he performs well, certainly, but, in my opinion, I think the opt-outs can potentially benefit a team just as much as the players. Imagine this scenario: Cueto is awesome for two years with the Giants, then opts out of his deal at age 32, signs with some other team for five years, gets old, injured, and ineffective, as 30-something pitchers tend to do, and the Giants are completely off the hook for his decline phase. It’s very realistic that this is simply a two-year deal masquerading as a long-term pact, and since I despise long-term deals for pitchers, I’m digging this opt-out thing. All the free agent attention this offseason centered around Zack Greinke and David Price (with good reason), but the Giants snagged an ace-caliber starter of their own in Cueto with a fraction of the fanfare. 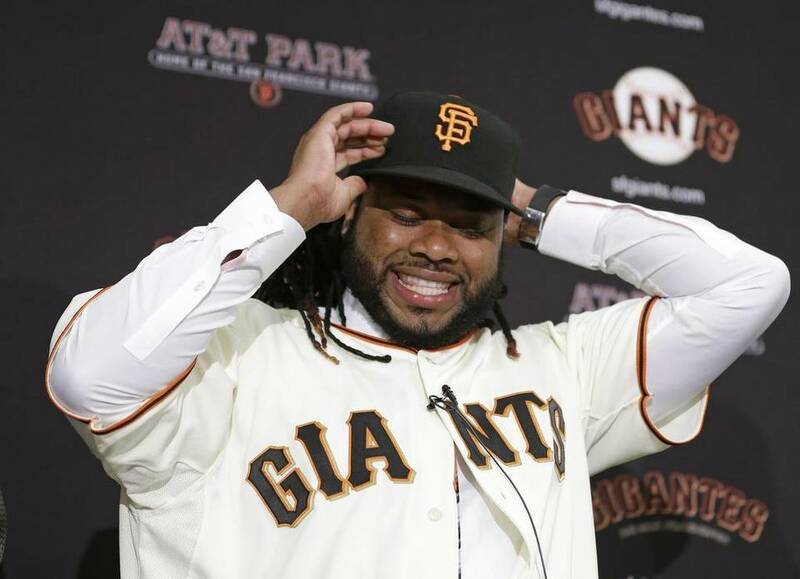 The Samardzija signing filled a need but the Cueto signing turned the Giants into a team to once again get very excited about. This entry was posted in Baseball, San Francisco Giants and tagged baseball, johnny cueto, san francisco giants. Bookmark the permalink.